Anyone know anything about a pizza place in Sheboygan? It apprently is the only midwest pizza joynt to be accredited by Italy. It was rated by Pat Bruno yesterday. Anyone been there? You are definitely referring to Il Ritrovo. The pizza is excellent. Worth a trip from Chicago. Trixie and I figured we use the weekend to take the drive up to Sheboygan, Wisconsin to check out Il Ritrovo. Being one of the few D.O.C-accredited pizzas in the Midwest, we thought it might be worth the trip. Not that that meant we were assured a great pizza or anything but being lovers of the classic Neapolitan style, we were intrigued. Apparently, the owner spent a lot of time in Naples learning classic pizza making techniques. 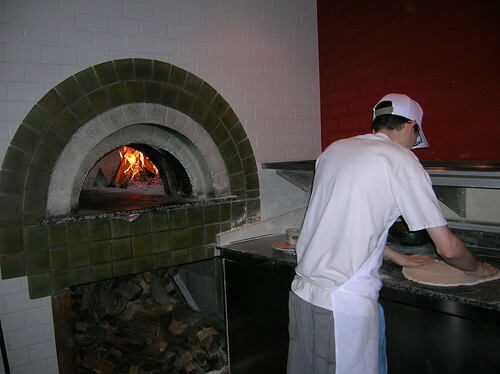 Il Ritrovo has a wonderful wood-burning oven, employing multiple piemen that operate it in the rear of the restaurant. Since we were sitting fairly close to the oven, we had a good view of their execution. I don’t think there is any doubt that these young guys received excellent instruction. The layout of the room is simple but inviting. Their attitude and feel is clearly meant for Sheboygan’s yuppie set; lots of pictures of classic Italian scenes with a backroom that stocks nothing but high-end Italian products. We opted for 2 types of pizzas; Margherita DOC with the usual imported mozzerella di bufalo, San Marzano tomatoes, and a little basil as well as their sausage and mushroom pizza that uses a Wisconsin cows milk mozzerella. The structure of the pies was true to form in terms of a Neapolitan pizza; focusing heavily on the importance of the crust. Tastewise, I found the crust to be extremely well made but somewhat lacked the depth that one gets in truly great Neapolitan pizza. The crust’s bottom did not have a uniform brownness to it, having sporadic black spots only. The texture, however, was sensational. I don’t recall any bubbling on the top at all. As far as the toppings went, everything was fresh and first rate except for their mozzarellas which I found relatively flavorless and lacking any depth. The highlight ingredient was their sausage, coarsely ground with just the right about of fennel. Overall, the pies were quite good. The efforts being put forth here at Il Ritrovo is outstanding compared to most Midwestern Neapolitan attempts and should definitely be sought after if you happen to be making a northward trek. If I were a resident of Sheboygan, I would consider myself extremely fortunate to have this place in my town. I'm gonna need to hit this place. We are now spending a good portion of the summer vacation in Sheboygan at the Blue Harbor Resort. With kids, or without, this place on the lake is awesome. I have eaten lunch at il ritrovo several times in the last couple of years, and I have always loved it. Trattoria Stefano is across the street, and is my favorite upscale Italian restaurant anywhere in the midwest, and gets a lot of business from The American Club (lots of golfers in the summer). Stefano is also the owner of il ritrovo. He closes down for 2 weeks every year and takes most of his staff to Italy. One of the best dishes that I have ever eaten is the venison osso bucco at Trattoria Stefano, though it wasnt on the menu when I was there 2 weeks ago, making an emergency pit-stop while driving my son home from camp. I did have an excellent truffled cheese fondue for a starter, and the seafood pasta special. The trattoria has an excellent, though pricey wine list. A great trip is to take the family to the Blue Harbor Resort, which has a Dells quality indoor waterpark, put the kids in the kids club for the evening, and stroll across the river to Stefano's. We have reserved for a couple of nights over Christmas break, and I am trying to work out 2 dinners at Trattoria and 3 lunchs at Il ritrovo, though my wife thinks that would be overdoing it. I have this on my list of things to do when I'm at the Blue Harbor for the Sept. 16 weekend. (This place has a beautful setting, right on the Lake. )I've planned a trip for about 17 families to this resort, a sister property of the Great Wolf in the Dells. I recently met someone who said I had to try Il Ritrovo and he gave me Stefano Viglietti's business card. He said I can buy bottles of wine from Stefano when I go for dinner. I'll look into that! He raved about the food/wine/friendly people. Adjacent to Il ritrovo is a gourmet food store/deli that stocks about 50 types of italian wine, most of which are on the list at Stefano's. They are pricey, and I dont know if there is a corkage charge if you drink them at Il ritrovo. I ate at Il Ritrovo in Sheboygan this evening, don't know if it is worth a trip from Chicago, but if in the area for sure stop by. Was fortunate enough to be sitting at the bar and have a conversation with the owner Stefano who is from the area and did a stint (non-cooking) in Chicago for awhile. He is looking to open a restaurant near Il Ritrovo that will feature all local/near local Wisconsin food. In speaking with him it was obvious that he had a real passion for the craft he was producing, it was very refreshing. We talked about all the choices of cuisine that us Chicagoans are so fortunate to have. He also had heard about Pizzeria Bianco and wanted to get out to Phoenix at some point to try. He is also assisting in opening a Neapolitan pizza shop in Chicago. For a starter I had the bruschetta. The tomato used was wonderfully flavored however; picture a nice slice of white crusty Italian bread with a lone 1/3 of a tomato in the center and some Italian parsley, garlic and olive oil over the rest of the bread. More tomatoes are needed, plain and simple. I felt quite cheated by this starter. The Magherita pizza is what I normally would have chose but the special pizza of the day, a sauce less Neapolitan pizza with some smoked mozzarella, pancetta, porcini and chanterelle mushrooms (which were in season) called out to me. GREAT CHOICE!! The mushrooms being in season were outstanding along with the slightly smoked cheese. I was not that thrilled with the dough, I wanted more crustiness. Stefano said any diner can simply request that their pizza get crusty a bit and the chef will hold the pizza up closer to the wood fire to get it crispier. I will certainly do that next time. I was too full to try anything else but am thinking of stopping by on my way home tomorrow evening even though it is an hour out of my way. We swung up to Sheboygan this evening for dinner after a day in Milwaukee. 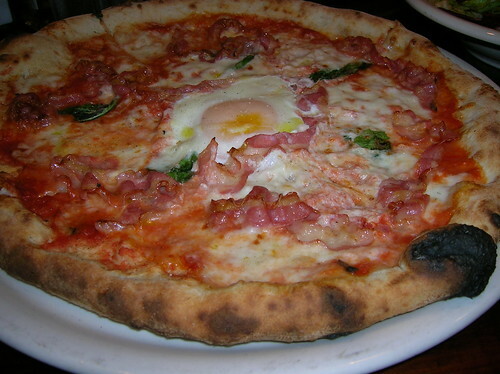 With Spacca Napoli in town now, I certainly don't think it's worth the trip from Chicago. But it's still worth the trip from Milwaukee, for me. We shared the calabrese (red base with calabrese salami, smoked mozz and basil) and a bianca (white with smoked mozz, fresh mozz, pancetta, and a black truffle cheese that I can't remember). Service was efficient and distant. The pizzas were very good, although as tp and pigmon noted, the crust is missing something. Spacca Napoli's crust is a good bit nicer, to me, with a lot more bread character. The pizzas overall, though, were fantastic. I'm glad to have leftovers in my fridge. Coincidently, I just returned from a retry of Il Ritrovo last week. Your above assessment is dead on. This time, however, I found Il Ritrovo’s use of slightly inferior ingredients compared to other serious neapolitan pizzerias to be evident. I thought that the mozzarella was a bit bland and empty. The crust was slightly soggy due to an overly watery tomato sauce. Even the bottom of the crust was slightly damp. Not horrible by a long shot but certainly notable when being critical of any pizzeria that is attempting to make neapolitan pizza at the highest levels. Still, a real nice stop whenever you're in Sheboygan or environs though. I killed 90 minutes sitting on a bench at Sheboygan beach yesterday so that I could eat at Il Ritrovo when it opened at 5 pm . . . and I was very pleased that I did. For more than a moment, I thought about driving back to base camp-Milwaukee and scrapping the whole idea. But part of the pleasure of vacation is being able to unplug the clock at a moment's notice. What better use of time could there be than being at the beach and watching the waves roll up to the shore? And if such activity -- or lack thereof -- could spark the appetite, that would be a bonus. In all honesty, it wasn't easy giving in to Il Ritrovo. At first, it felt pretentious and I grew immediately resentful. As my family and a few early-arriving others were corralled, against our wills, into the adjacent market shop, we wondered collectively why we couldn't just be seated at 4:57. Nonetheless, we waited with growing ambivalence and when the clock finally clicked forward to 5pm, we continued to stand patiently as the hostess seated each party individually, in the order in which we'd arrived. I'm not sure if there were enough of us present to actually fill the restaurant but I tried to appreciate the order she was applying to the room. It wasn't her fault but our waitress's recitation of the daily specials nearly put me in trance. There were so many of them and as she continued on, the ones she mentioned first were beginning to slip away (oh, that shore air!). Since she'd engaged both us and the table next to us for this reading, I again found myself irritated. 'Wouldn't this just be easier for everyone if instead of reading the list over and over again all night, someone had simply taken the time to write it on a board -- just once -- for everyone in the restaurant to see?' I'm sure there is a perfectly good reason for doing it this way . . . In all seriousness, Il Ritrovo's menu -- plus the specials -- offered a terrific and wider-than-expected selection and I was delighted to have nearly a half-dozen choices when it came to salads and appetizers. I also really liked the comprehensive list of pizza offerings, which included some tantalizing combinations and a good variety of 'single-topping' options, too. These bruschetta were topped with either white bean/corn puree or goat-cheese topped with olive tapenade. Both versions were solid but the garlic in the puree was a bit aggressive. I thoroughly enjoyed the cheese/tapenade version as well the variety of stellar olives served with this. A trio of meats were also served on the platter. The pepperoni was just ok but the mortadella and the salami were outstanding. Mesclun mix, cherry tomatoes, fennel, fresh mozzarella, olive oil and white wine vinegar dressing. I enjoyed this salad but not as much as the next one . . .
Bibb lettuce, fennel, radicchio, cucumber, carrots and tomato served with a lemon, olive oil, aged balsamic vinegar dressing. Fine ingredients but it was specifically the sweetness of the balsamic that made this salad the better of the two. I thought the sweetness brought the other elements together in a pleasing way. With the foreplay now out of the way, it was time for the main event, the pizza. Actually, one of the chefs told me that it was "the oven" that was the star. I consider this to be something of a "chicken and egg" situation. For nearly all intents and purposes, these 2 entities are inseparable at Il Ritrovo. And the oven is certainly dramatic . . .
We ordered 3 pies and they were each sensational . . .
Prosciutto de Parma, mozzarella, tomato and arugula. This pizza was delicious and I really appreciated the tender, baby arugula. I've had this before with more fully-grown arugula and while the flavor was pretty similar, the tender texture of the baby greens took this pie to a level I'd never experienced before. Tomato, mozzarella and Italian sausage. I was surprised by this delicious pie. The sausage delivered distinctive, balanced notes of fennel seed and garlic. Rosemary, black truffle cheese, smoked mozzarella and pancetta. This pizza, especially the bites that contained pancetta, were sublime. This was a pungent, aromatic and flavorful combination that was mightily compelling. I'm sure there are several folks here who could analyze this crust shot like CSI's and recite the pie's entire history. I'm including it for reference. I thought it was just about perfect, with enough char to season the remainder of the crust, without overpowering it. It was pleasantly chewy -- then tender -- with a crispy exterior and the flavor was really in the chew. The centers of the pies, which I did not photograph were tender and soft without being wet or limp. Again, for reference. I liked the char and thought that any more of it might have thrown off the balance of flavors. I'm so glad I decided to stick it out and try Il Ritrovo. It really was terrific and after enjoying it so much, I'm embarrassed that I initially let some of its well-intentioned idiosyncracies rub me the wrong way. Clearly, I was a bit hungrier than I realized and darned crabby because of it. The bottom line is that I look forward to returning to Il Ritrovo and next time, I'll be looking forward to every aspect of it. Lately I've found myself in the Northern suburbs of Milwaukee a little more than usual, so decided to check out Il Ritrovo in Sheboygan. Il Ritrovo makes a terrific first impression, three separate and distinct rooms, restaurant, coffee/wine bar w deli, dry goods, wine, produce, and a cute as all get-out breakfast lunch area with a diner feel. Place is spotless, people are friendly, well stocked and reasonable, for upscale items, pricing. When I asked if I could have pizza in the coffee bar area the answer was a friendly, and sincere, "hon, you can eat anywhere you like, long as you're happy" I opted for the restaurant with a nice view of the pizza oven, very comfortable seating, they even sat me at a 4-top for comfort as it was early and not yet busy. Hyper friendly waitress brought crusty bread and a menu, recited the daily specials and soon came back with the best latte I've ever had in Wisconsin. I opted for a daily special soup, Pappa Al Pomodoro, bursting with balanced tomato flavor, hint of acidity, bread lending structure with a generous float of good quality olive oil bringing it all in tune. Minor quibble - onions were not sweated enough and were texturally inconsistent with the soup. 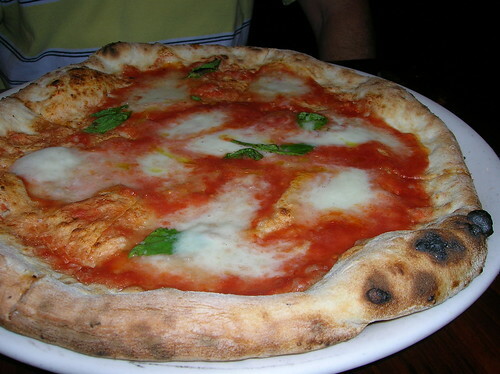 I went with Margherita DOC, imported mozzarella di bufalo, tomato and basil. Quality ingredients, though the cheese did not seem buffalo mozzarella rich (did they make a mistake?) but the crust was the real disappointment. The middle of the pie was a bit damp from the fresh mozzarella, which I like, but the outside and bottom were not crisp, the outer ring was fairly flat and doughy in the middle, it did not seem cooked though. I pointed this out to the waitress who seemed very interested/customer service wow, sorry, the pizza chef, on the other hand, could not care less. I even took the pie up to the pizza maker and he, supposedly tasted the crust, and shrugged. Said "they are only in there for 7-8 minutes, might not get done" I was flabbergasted. This is a DOC designated pizza spot? They took half the cost of the pizza off the bill with a note, something to the effect, ~thanks for your input,~ pretty much what I say when I want someone to buzz off. I had high expectations, they were not fulfilled. I'd go back for a second try if in the area, but would not make a special trip from Milwaukee. the best latte I've ever had in Wisconsin. G Wiv wrote: I'd go back for a second try if in the area, but would not make a special trip from Milwaukee. Wow. I've eaten at Il Ritrovo at least a dozen times, and have never had an undercooked pie, much less a bad customer-relations experience. I'm sure Stefano, the owner, would be mortified if he knew. Mrs. JiLS and I enjoyed lunch this Saturday at Il Ritrovo. The place was packed (good news for this downtown revival location), so we sat at the bar. Service was a bit slow, although the big crowd probably explains and excuses. We had a nice bruschetta and the margherita DOC and the prosciutto and olive pizzas. All were very competently prepared. Would I recommend driving to Sheboygan rather than going to Coalfire or Spacca Napoli? Absolutely not. But if you are on your way to the Oneida casino in Green Bay? Absolutely so. Happy to report that Il Ritrovo and it's next-door market are still firing on all cylinders. Our group of 4 stopped for lunch on the way up to the U.P. on Friday--nice and busy, but no wait for a table. We started with a Giardiniera salad (house-made spicy and sweet mixed vegetable salad served with mixed greens in a white wine vinaigrette, with fennel, cherry tomato, and hot copper salami and aged provolone) and the Misto di Mare (octopus salad, rainbow trout mousse, insalata Greca, white anchovies, and arugula)--both were terrific. The pickled vegetables in the Giardiniera salad weren't really sweet at all--just perfectly spiced and nicely tangy) and the octopus salad and trout mousse on the seafood plate were equally delicious. And the pizza--I hadn't read any of the comments in the thread until now--and whatever issues folks had with the crust, we experienced none of them. We had the Prosciutto Crudo E Ruchetta (Tomato, mozzarella, parmigiano, prosciutto di Parma, arugula) and the Il Maialino (Tomato, mozzarella, Calabrian chili paste, smoked mozzarella, salami, Italian sausage, smoked pork oil, onion). Both were great but the Maialino was one of the best pizzas I've ever eaten. I'm not usually a "meat lover pizza" gal but this was spectacular. And not a bit over the top. Crust, toppings and cheese were all perfectly balanced and each ingredient sang. I'd easily drive to Sheboygan for that pizza. The adjacent market was also a treat--we were on our way to Iron Mountain to share a house with a bunch of other LTHers for the weekend so we stocked up pretty liberally--a couple of pates, some jowl bacon, cheeses, whitefish spread, wine, Bitters--all from a crazy high quality selection, particularly for an area we wouldn't normally associate with this kind of gourmet spot. The highlight was a shaved Berkshire ham that I'll be thinking about for a long time--assuming I can't track it down here. No clue what purveyor, which is unfortunate. May have to trek up there again soon to get some more! As the man says--Il Ritrovo--Count me a (HUGE) fan!